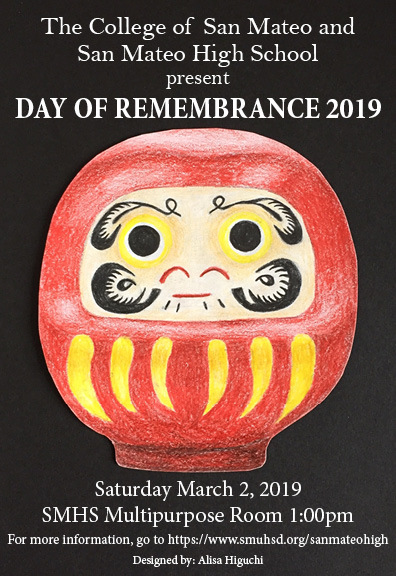 The College of San Mateo Ethnic Studies and History Departments, and San Mateo High School is inviting you to join us on Saturday, March 2, 2019 at 1:00 PM, at the San Mateo High School Multipurpose Room for a Day of Remembrance. The Day of Remembrance is an annual ceremony held around February 19th. This event is held to commemorate the signing of President Franklin D. Roosevelt's Executive Order 9066, on February 19, 1942 . E.O. 9066 authorized the U.S. military to mass incarcerate all persons of Japanese ancestry into concentration camps. San Mateo County Japanese Americans were first taken away to Tanforan Race Track in San Bruno. At that time,there were 33 Japanese Americans students attending SMHS with 6 of them being seniors. SMHS Principal William T. Van Voris with a group of teachers, and San Mateo residents attended the commencement on June 16, 1942 at Tanforan. Eight members of the band traveled to Tanforan and performed the Star Spangled Banner. We want to thank Principal Van Voris, Coach Smith, Mr. Brose, Mrs. H. Kaplan, and Mrs. Benner and the bandmembers (and all their family members) for their act of courage, kindness, civil rights, friendship, compassion, and bravery towards their class members. Most likely persons from that era are probably not with us anymore or may have moved out of the area but we are optimistic that family members may still live in the area. We want to acknowledge them. If you have any additional information on this and/or know of persons who participated in the band at that time or know of surviving family members, please contact us at: smhsdor2019@gmail.com or Lewis Kawahara. Thank you and we hope to see you on Saturday, March 2, 2019.